All About Artful Media Group, Inc.
My friend Devin shared a site of links to the Jerry Sandusky case, along with a commentary. If you don't know what is going on with Jerry Sandusky, catch up here. There are a string of articles under Top Stories. Jerry Sandusky, a former defensive coordinator under Paterno, has been charged with sexually abusing eight boys across a 15-year period, and Paterno has been widely criticized for failing to involve the police when he learned of an allegation of one assault of a young boy in 2002. I read through the commentary and I heard the exact feelings any sane, feeling person would have: bewildered, angry, judgmental, and worse. My husband I just went through a class called "Safeguarding God's Children." It was our second go-round, and it hadn't changed a bit in the intervening years. It's part of the training and certification the church requires in order for you to participate in children's activities now, such as go on field trips, attend class parties, etc. Only the church requires this of parents of students and we all know why. You'd think the training would at least make a pretense of being about overall child welfare, but it doesn't. It is unashamedly specifically about child sexual abuse. It is unabashedly about teaching adults to watch for signs and how to report it. It teaches by sucking your soul out through your mouth by way of videos from predators, parents of victims and the victims themselves. You are left sitting in a room with people who cannot look one another in the eye for at least a week afterwards. Statistics say odds are someone in that room was abused or know someone who was, and worse, that possibly someone was a predator. The instructor was clear: you do know it when you see it, and you should never talk yourself out of it. It's not your choice to make, to decide whether it is or isn't something or whether someone should do something. What you do is report it and let experts figure it out. There are a lot of scare stories about "false allegations" that "ruin lives." I can tell you I know at least five families who have been investigated and I guarantee most people never knew. How did I know? Because each of them told me. They were all innocent, proved so, and resumed life as normal after dealing with what happened. In the end, as angry and scared as it made them, each confided to me that on some level, they'd rather these things be taken seriously and investigated. But I bet for each of those five families there were 20 people who should have been investigated and were not. It's because it wasn't what we wanted to hear. I was just listening to Joan Didion talk about being a parent --well, and, a person really -- and how this one time she was line editing her daughter Quintana's writing and was completely missing the pain and anxiety her daughter was expressing. She did eventually realize her daughter wasn't writing sunshine and roses, but she said that all the while her daughter was borderline personality with severe depression and so forth, she was also very amusing. "And amusing is what I could relate to," Didion said. She went on to say that we are so bounded by what we expect and can relate to that sometimes we tune out what is really being said to us. It's a sort of listening block. I think it's also an empathic failure: we don't want what is, to be. And so we tune it out and tune into what appeals to us. It leaves us, often, confused and befuddled by what seems to be a sudden action on the part of someone we know. But also, we like to please those we care about, and so we can be very good at putting on the right show, or enough of it, to maintain the myth. Also, ramifications can be very scary. Worse in our minds, usually. But also, we inherently know that nobody likes a whistle blower. The kid who made everyone recognize the emperor wore no clothes never had a statue made in his honor. In fact, we don't rally know what happened to him because all the news reported was some kid yelling and then attention switched back to the emperor and the canny, con artist tailors. We need to be cautious about where we fixate our attention. It's easy to look only at the thing that inspires our first, fastest and most familiar emotion: anger. It's easy to fixate on accused, the perpetrator, the guilty. It's easier to sit in place as judge and jury. It's much, much harder to sit in the place of the victim. That's if we can process and believe, that is. Most of the time we can't, because it's not what we expected to hear. It's not what we wanted to hear. It wasn't what worked for us. It was not what we could relate to. And so...we tune out. We minimize. We rationalize. "It didn't seem like that big of a deal." "It didn't seem like anything criminal." It's because it wasn't what we wanted to hear. Somebody had a good thing going and didn't want to disrupt that. I get it. It's not easy to be the disrupter. It easy to be the Monday morning quarterback, pun intended. Of course, from over here, from now, it seems obvious what should have been done. We need to know how, though. The one thing that was most useful in the training class we had to take was the lessons about how to confront. I'm looking at and listening to the vulnerable. The victims. One more birthday, another year older...HURRAY! It's my birthday! Hallelujah for another birthday! I am one year closer to my 2 pm glass of wine and nap! One year closer to wearing hats every day (that aren't ball caps). One year closer to being able to say, "I'm old, I've earned the privilege of being irascible, now sod off!" which has a dual purpose of play on words: "take a hike" and "get off my lawn." Also it will force the Autocorrect Generation to go look up a word. HEH! I am truly grateful to get to celebrate another birthday. My 40s have turned into a time of watching friends with major health crises and losing friends way too young. Each week, it seems, someone else gets struck by cancer. My body has turned into a habitable inn for skin cancer, aches, pains, fat cells, and other things I don't enjoy playing host to, but they are minor inconveniences I can work around. They do not take over my internal space like a garrisoning invading army. And so I am grateful. Grateful this birthday is one more for me, one more for my family. A day to celebrate, instead of miss. Lucky. So, so lucky. A friend sent me a birthday wish with the joke, "28 again I assume!" It has been many years, more than a baker's dozen, since I've been 28. So I cheekily replied, "I don't mind admitting I am over 40 but I also don't mind admitting I like hearing I look 28 while doing it!" Birthdays are for fun like that. I wanted to find a simple action I could take to fulfill this in a tangible way as well as continuing to work to fulfill it in myriad other ways. I thought of cards. I was so pleased to receive something nice like this in the mail. I know how much effort it takes to do a real card, old-fashioned way, and I was overjoyed to have merited just that little extra thought and effort. It made me feel this sense of value and friendship. Combine that with my new commitment to hand writing things to connect better with them as thoughts, and you had a pledge. I want to take the time--and let's not get crazy with this, so say one a month at least, at the start, maybe on the 1st of the month--to handwrite and mail a card with a friendly message inside to someone. That takes a good pen (oh yea! an excuse to go pen shopping) and stationary. Luckily, Tiny Prints came along with a cause that I believe in: More Birthdays...and less cancer. I've already ordered a full set. If you'd like one, email me your address. J pippert at gmail dot com. It doesn't have to be for a birthday, by the way. It can be for any reason, any day. The American Cancer Society believes that every birthday is a victory – another year that cancer has not won. Thanks in part to the Society’s cutting-edge scientific research, patient support, and prevention, education, and advocacy efforts, 11 million cancer survivors will celebrate another birthday this year. Tiny Prints – an online stationary boutique – is fighting for more birthdays with an exclusive card collection on TinyPrints.com that is inspired by all of the ways the American Cancer Society saves lives. The card collection features the inspired artwork of the American Cancer Society’s more birthdays artists, such as Am I Collective, Andrew Bannecker and Create More Birthdays Contest winner, Marilyn Brown. 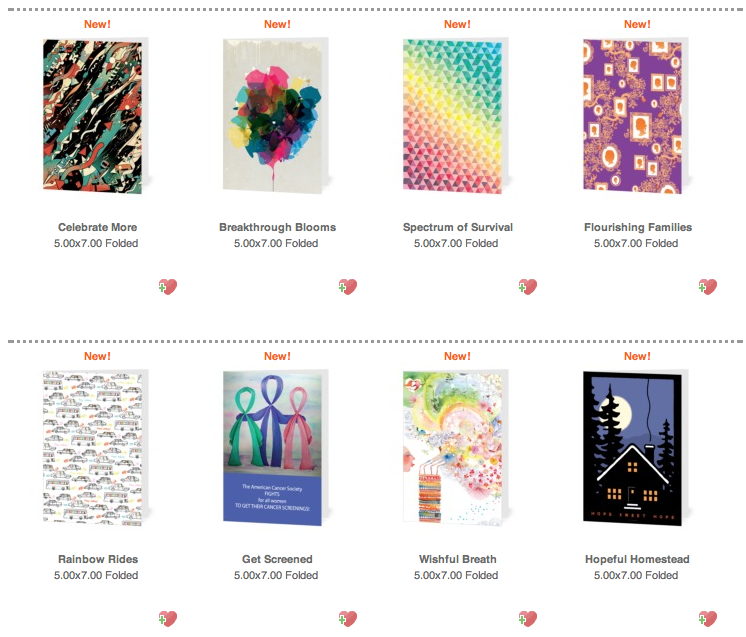 From now until April 30, 2012, the Tiny Prints more birthdays card collection will be available at their site. This sponsored post was written in conjunction with the American Cancer Society/Tiny Prints card collection launch. All content and opinions expressed here are my own. 2. Women must view themselves as their own change agents and foster their own inner potential, thereby breaking through any perceived glass ceilings through hard work and continual success that stems from belief in themselves as leaders and succeeders. The problem with this subscription to one or the other camp is that it fosters a high school football team style loyalty to one side, with a competitive disdain for the other. I read a post that subscribes to Fostering Inner Female Success and the skepticism about an inherently discriminatory system boiled over into outright disgust for the whiny self-described victims. I read a post that subscribes to Fight the Discriminatory System and the aversion to naivete about hard work being the secret to guaranteed success boiled over to antipathy and contempt. Not all tales are so full of derision, of course, but I just keep seeing this ever-widening, consistently reinforced divide. And I call BS on this -- that these two points are mutually exclusive. It's naive to subscribe one or the other exclusively. In general, most women who talk about discrimination are not being whiners; they're trying to reveal that the Emperor has no clothes and they are perplexed and stymied as to why some people keep insisting that he does. In general, most women who talk about teaching women to do for themselves are not oversimplifying and ignoring the real issue; they are seeing that from girlhood, women need to reinforce that despite whatever kind of world there is out there, they have what it takes to accomplish what they need. I've been in the work force since 1985. That's given me occasion to see plenty of situations in which women did and did not succeed, or where women were able to balance their lives or were forced to choose. We like to think that success is within our control, and that if we do everything right, we can win at this game. I sincerely hope the current economic situation and the many, many 99% stories floating around the Internet has taught us the fallacy of this line of thinking. The truth is that there is inherent discrimination -- of all types, but for this discussion, let's focus on women -- in the system. The truth also is that we need to foster belief in women of their ability to climb the ladder as far as they'd like to go and accomplish what they'd like to, in as much as that is reasonably possible and knowing that goals shift. If we really want to enable women to succeed -- and by virtue of their success, all of us -- then we need to work to improve matters on both fronts, together. United. When I entered the workforce, I was given two pieces of advice by a female attorney friend of the family: never let them know you can type or make a pot of coffee. She also suggested growing nails just long enough to inhibit typing. As a writer, this would never have worked. But I caught the message, the meaning between the lines. Despite having the same JD from the same school as many lawyers in her firm, she was still grouped with the secretarial pool. That's how things were back then. I learned to discourage men from ever complimenting my appearance, which is how many had been taught to interact with women, because of rampant sexual harassment and the problem of being viewed as "Woman" instead of coworker. I wore shapeless suits and pants. My experience is different than women entering their 20s and the workforce today, as it is different from women the generation ahead of me. We've experienced change, but I'm not ready to commit yet to calling it progress. Progress is defined as steady improvement of a society. We have not, actually, steadily improved in equality, though we have made advances on a number of fronts. Many have mistaken potential as true opportunity, thus believing in progress for women's quality. However, one of those changes -- the current economic downturn and recession -- are full of potential to create true progress. Today's technology combined with a heavy opportunity for small, niche businesses can be the way to foster equality and women's success. Smaller business can also better mentor young women. Flexibility, telecommuting, improved technology and other tools plus an entrepreneurial environment opens up the door for women and men alike to better achieve their personal and professional goals with solid balance. But we must work together and we must acknowledge that this benefits everyone -- not just women, and it's not a selfish goal -- and it requires improving the system for better true opportunity while fostering girls and boys to realize their own personal potential. Writing is my profession & living. My blog accepts opportunities to earn revenue. For ads, reviews, PR, etc. on my blog, email jpippert at g mail dot com. You spam, you pay. Spammers will be invoiced $10 per spam ad left anywhere on my blog. I keep commenter and other identifying information private, and do not sell, rent, or otherwise distribute any information I receive via this blog without permission. As stated above, writing is my profession & living. I enjoy links and love when my articles move someone to C&P, quote, reprint, etc. However, please do not reprint or reproduce any of my articles in part or in full, photographs or art without permission. Contact me at j pippert at g mail dot com for permission. And if you are kind enough to link? Please let me know so I can slavishly thank you.